As someone who helped launch Beebe Healthcare’s Celebrate Excellent Care program and this Tuesday column, I am happy to again be contributing both an article and a gift. The first time was in 2012, when I contributed funds for the purchase of equipment in honor of my oncology surgeon, Dr. James Spellman. This time I am celebrating Beebe’s Adult Activities Center at the Gull House. My own story with Gull House began in 2002 when my late wife, Eileen, was diagnosed with Alzheimer’s disease. In 2003, she began to visit there three days a week, giving me some time to do things she was no longer capable of doing and to take care of my own health problems. At that time, I also received my commercial driver’s license so I could take Gull House clients on day trips by bus once a month as a Beebe volunteer. Gull House also had occasional receptions and parties for the clients’ families, which Eileen’s children and grandchildren enjoyed attending. Eileen passed away in 2007. Recently, Eileen’s son, Tim Hamilton, who lives out of state, visited me and told me he has been donating to Gull House for years because he was so impressed by the care the staff had shown his mother. Giving this monthly gift to Beebe is Tim’s way of remembering his mom and saying thank you to Gull House for the extraordinary care and compassion shown to her. Tim knows how important it is to continue to give and support such a needed service for those families who struggle with Alzheimer’s. Beebe’s Gull House is a safe and beautiful place for loved ones and their caregivers, providing support, excellent care, and the courage to stay strong. After considering Tim’s generous support for Gull House, I too decided to make a gift to support this important place and program. I was able to make a gift from my IRA by giving my Required Minimum Distribution directly to Beebe Medical Foundation for Gull House. IRA Charitable Rollovers allow donors over 70 years old to distribute up to $100,000 ($200,000 for a couple) from an IRA per year directly to a nonprofit, which counts toward the annual mandatory withdrawal. This allowed me to exclude a portion of my retirement savings from income tax by donating it to Beebe. The Gull House first opened in 1987 when Beebe partnered with the Delaware Division of Services for Aging and Adults with Physical Disabilities in response to the community's need for an intermediate care facility to bridge the gap between 24-hour home care and nursing home care. Its services are a vital part of the continuum of care for the elderly, providing a healthful atmosphere, and reassurance and support to clients’ families. 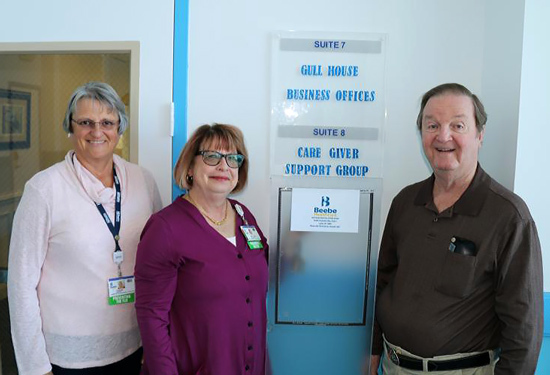 The Adult Activities Center at the Gull House recently moved to 34382 Carpenter Way, Lewes, after decades of providing care for clients in Rehoboth Beach. It provides a structured and supervised adult day care program designed for functionally impaired persons who are 60 years of age or older. The primary goals are to avoid or forestall long-term care treatment; to support or improve social, mental, emotional and physical levels of functioning; to enhance the quality of life; and to provide respite to families and caregivers. “In celebration of our recent move to our new location, we invite the public to an Open House at the Adult Activities Center at the Gull House, 34382 Carpenter Way, Lewes, from 3 to 6 p.m., Tuesday, Nov. 27,” said Gull House Manager Kathleen Graham-Frey. The center offers free tours during the week to potential clients and caregivers. There is also a lending library and resource room for caregivers. A support group, which is open to the public, meets on the third Thursday of each month at 1 p.m. For more information or to schedule a tour, call (302) 703-3576 or go to www.beebehealthcare.org/gull-house. As a community-based, not-for-profit healthcare system, Beebe Healthcare depends on the generous support of the community. All gifts to Beebe are tax-deductible and are channeled through Beebe Medical Foundation. To learn more about directing an IRA Required Minimum Distribution to benefit Beebe, contact Beebe Medical Foundation at (302) 644-2900 or foundation@beebehealthcare.org. To make a gift, go to www.beebemedicalfoundation.org. Gifts can be designated to specific areas such as the Gull House.